No evidence of the presence of life on Mars has yet been found, but more recent studies of the Martian landscape suggest that in the past abundant surface water may have been present, which could have enabled life to exist. 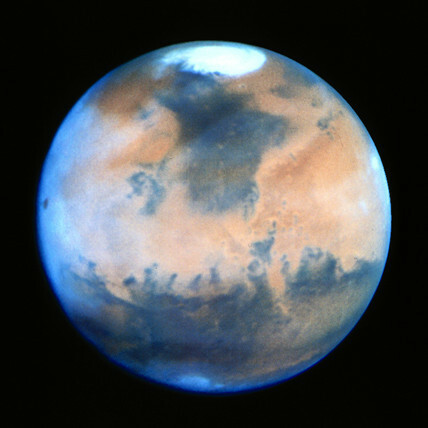 Today Mars has a very thin atmosphere, mainly of carbon dioxide. No liquid surface water exists, but there are permanent polar ice caps, made up of frozen water and carbon dioxide (dry ice). Surface temperatures range from -133 degrees C at the poles in winter, to 27 degrees C on the day side in summer. The HST was put into orbit in 1990 and was designed to see seven times further into space than previously posible. It allowed the Universe to be viewed in unprecedented detail without the distortion caused by the Earth's atmosphere.